June's Gun of the Month is the very first factory engraved and gold inlaid Colt Model N, blued finish with Type II slide markings and 17 gold inlays. This is also the first Model N with factory monogrammed ("JAB") relief-carved mother-of-pearl grips. 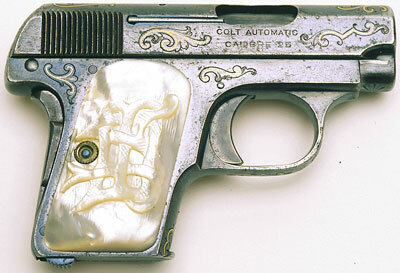 The engraving, inlay and carved grips were performed by Colt master engraver, Cuno Helfricht. Perhaps the most unique aspect of engraving on this pistol is that when the work was performed, no pre-defined styles of engraving or inlay existed for the Model N. Eight of the Model Ns are noted in the shipping records as having any type of factory gold inlay work. In 1909, elaborate embellishments like these would have tripled the retail price of a standard Model N pistol.